I wore this outfit Saturday night. We went to a friend's house to celebrate his birthday. This dress is a new purchase; it's super soft and cozy; paired with fleece tights I feel like I'm in pajamas. Add heeled boots and a statement necklace and I look festive even though I'm in head to toe fleece. Especially nice on a super windy day like this one was (no that's not bedhead, that's Mother Nature giving me a tousled ‘do). Now let's get to the reason for the title of this blog post. Wearing new clothes as a fashion blogger is great – you link to the exact item, it's easy to find similar pieces in other sizes, life is grand. But say you're wearing beloved boots that are older than your child, that have been reheeled and resoled a zillion times, that were altered to fit your wide calves and short legs. And maybe your statement necklace and bracelet are over a year old and no longer made. Well, I could link to similar pieces but honestly there isn't anything similar out there on the market. So if I click similar I'll just annoy you by linking to stretch stiletto boots for skinny legs or dumpy riding boots with too many buckles. When I bought these boots from Wide Widths almost a decade ago, I had a hard time choosing a pair from all the options. 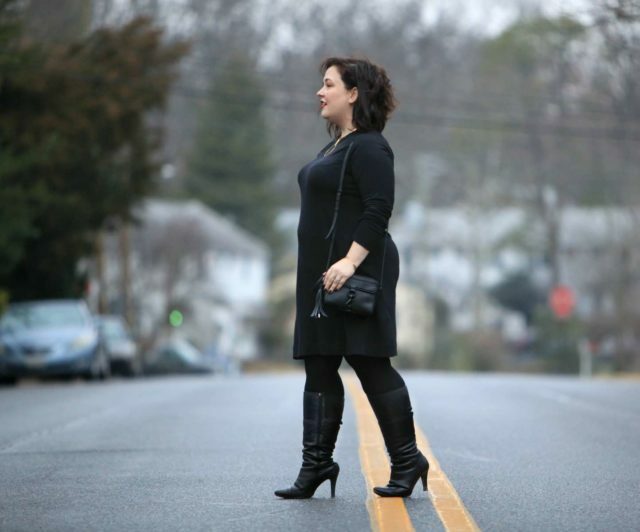 There were a lot of styles that were sleek, chic, and dressy yet fit my mondo extra wide calves. These days, it's near impossible to find wide calf boots that have a heel and not a platform (or too many buckles – what's up with all the buckles on wide calf boots?). If you find a decent silhouette, usually they're made of faux leather and not crafted to last more than a season or two. If they're stylish and well made, they're not cut for wide calves. These boots are past their prime. The elastic is shot, one zipper is broken and won't unzip, and as I mentioned above, they've been reheeled and resoled a zillion times. I used to get my wide calf boot fix from DUO, but when they became Ted & Muffy the fit changed along with the quality for price. So not only would I love to link to something similar, I'd love to buy it. 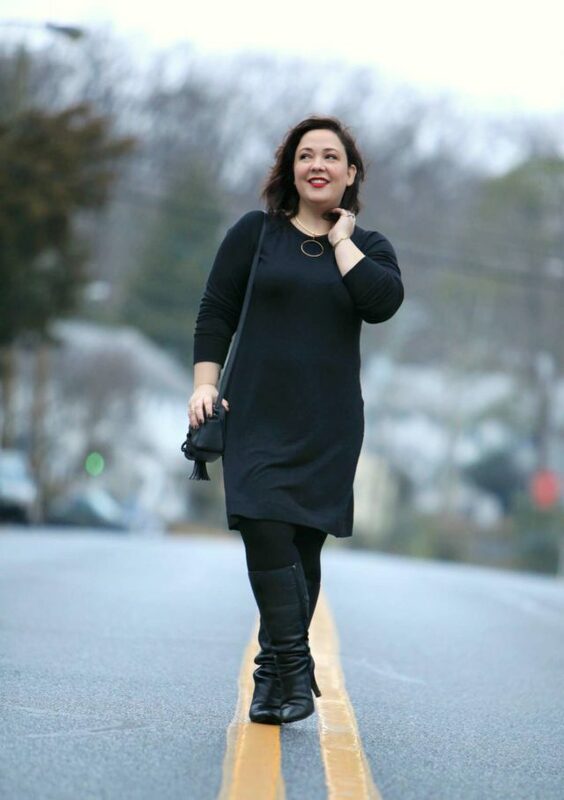 Plus size fashion has improved over the past decade but it's still near impossible to find well-made, elegant boots for plus size legs. And no, a 17″ shaft instead of a 16″ shaft is NOT wide calf, thanks so much Kate Spade. So world, if you make real leather boots for a 19″ calf that are on trend styles, call me, we'll do lunch, K? Great rant. And also, you look terrific, peeved or not! I’m not trying to argue, just wanted to let you know that the struggle is real for many…I have big feet (10) but narrow calves. I CANNOT find boots that don’t flop off my legs and still fit my feet!! I don’t understand why they can’t offer options for various calf sizes!! I do recommend Ted & Muffy for this, they go in both directions for shaft width and have all the same sizes of shafts regardless of foot size. Worth it to check them out, especially when they’re having a sale! As another lady with wide calves, one of my biggest frustrations is pants that are too tight in the calves! I love ankle pants but don’t want to look like a sausage from the ankle to the knee. I hear you with that, straight leg jeans are my version of skinny jeans; skinny jeans don’t always even fit over my legs and if they do they look like leggings! I have an amazing pair of wide calf suede boots from Aerosoles that I bought last year for a trip to Ireland. Bought them directly from the Aerosoles website. I’m wearing them now, and wear them constantly they’re so comfortable! They have a 2nd zipper with extra material that makes the calf size adjustable. The nice thing about this is if I’m wearing thin leggings I can zip up more and if I have jeans on or a tall pair of thick socks, I can have more room in the calf. I just checked their website the other day but I didn’t see any tall boots, hoping later in the year they’ll return, because I’d love another pair or 2 just like this. Thanks for this tip Hilary. I’ve always liked Aerosoles but have never tried their tall boots! While we’re talking about such things, why do clothing manufactures think that all “plus” women are short. Some of us are plus and tall. In so many pants you can purchase “tall” or “plus” but not both. I don’t understand that. I need a long length AND a big size. Amen! Though it’s nice to see brands like ELOQUII branching out into lengths, I hope they keep expanding that selection and other brands take notice! Wide calf boots are absolutely the worst. In the boots that I have tried, there’s also the assumption that you must have wide feet. I own a pair that feels a full size larger than intended, and my feet slide all around the shoe. I end up wearing two pairs of socks to make up for it. I’m glad the brown boot over skinny jean trend is dying, but for a decade I’ve found the benefit of a sleeker tall dress boot in my wardrobe. Not all with wide calves have them because they’re big people or have big feet! Agree with the ankle boot, it’s a great equalizer! Agreed! I seldom wear taller boots over skinny jeans or pants anymore, but I still consistently wear a dressier heeled boot with skirts and dresses and tights. I live in Wisconsin and it’s great being able to reach for a dress boot to add an extra layer of warmth for a night out. Exactly! Tall boots and fleece tights are the only way I can wear dresses in winter, and the heel makes them nice for nights out! Crap! I am still wearing my brown boots over skinny jeans every weekend… it took me years to find the right fit in boots AND jeans. Oh no, if you like it and it fits your personal style ROCK those boots and jeans! Trends now are so fluid there’s no definite in or out. However I do caution you wearing it with a blanket scarf and/or puffer vest. But with a sweater or blazer or a blouse it’s great! Another ankle boot fan here. It’s just easier!! Also Allie – that lipstick is AWESOME. Or, just because you have wide calves, they assume your feet are also wide! I have two pairs of boots I treat like gold because I don’t want to wear them out (pun sorta intended). I’ve even embraced the trend of moto boots with dresses because I want to wear boots. 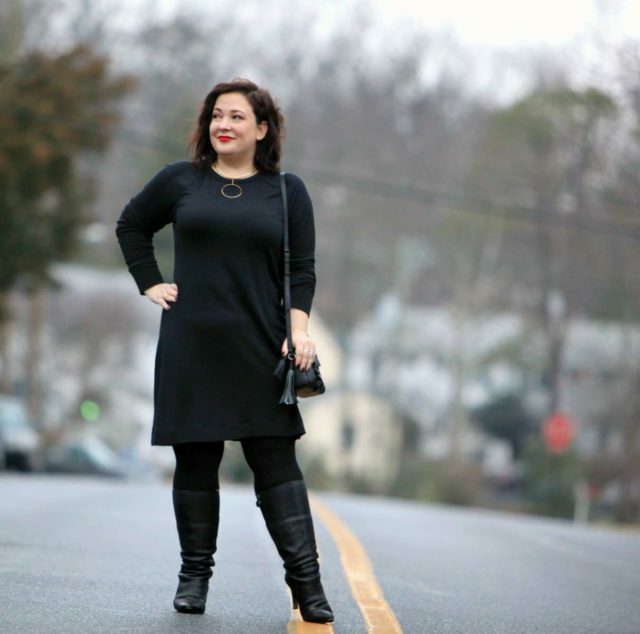 I love your blog and your no-nonsense approach to fashion and life! So true – wide calf doesn’t mean wide foot! And thanks so much Marsha! Super chic outfit. Perfect for visiting a modern art museum (minimalist but interesting). That necklace! Thank you Clara! And this necklace was a Nordstrom Anniversary Sale impulse buy and I love it so much. Argento Vivo costume jewelry is really good quality. Also the pendant comes off so I can wear just the collar alone or even add a different pendant to it! You look fabulous! Your boots don’t look that old at all. The key to making any leather items last is upkeep. Your boots reflect that. Regarding sizing, I have the opposite problem, skinny calves. So typically in the past, boots fit awkwardly making my legs look even thinner. The newer styles are getting thinner and are fitting me nicely. If there’s a cobbler in your area I can’t recommend getting boots altered enough. It’s pretty easy to narrow shafts, they can take an existing seam or two and nip in there. And if they stretch out over the years they can nip them again. But you’re right, the latest looks are far sleeker and slimmer which is a good thing for you! Gobble them up, a good boot is timeless! Also, boots that fit wide ankles as well as wide calves, please. I have gotten boots a couple of times that should fit my wide calves, but I can’t zip them up past my ankles. Yes! Yes! A thousand times yes! The quality offerings for wide calf boots are a joke. It’s sooo bad. Just because our legs are bigger doesn’t mean we don’t have style or the money to buy style! What a delight to read you lovingly and unapologetically describe your “mondo extra wide calves”. Refreshing and makes me feel stronger just reading it.